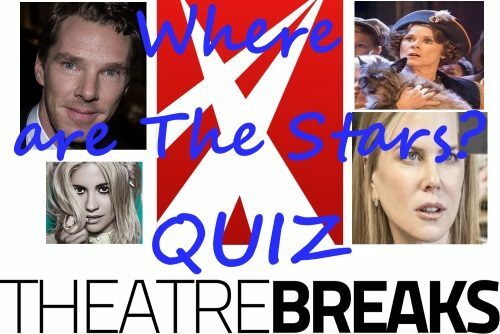 TheatreBreaks.co.uk has welcomed some big stars and celebrities to London’s Theatreland this year. But do you know which parts they’ve been playing and what shows they will be appearing in? Here are seven questions to test your theatreland knowledge. Benedict Cumberbatch is playing which Shakespearean character at the Barbican Theatre? 2. Which scientist is Nicole Kidman playing in Photograph 51? 3. Which ex-Pussycat Doll played Grizabella in Andrew Lloyd Webber’s Cats? 4. Who did David Suchet play in The Importance of Being Earnest in 2015? 5. Imelda Staunton plays Gypsy Rose Lee at the Savoy, in which musical? 6. Which father and son team starred in the stage adaptation of Dear Lupin at the Apollo Theatre? 7. Looking forward to 2016, Pixie Lott will take on the role of Holly Golightly, but in which play? So that wasn’t too hard, was it? If you are into theatre why not tell us more in the 2015 Theatre Breaks Survey – you could win a London Theatre Break!